What Wheels Fit 4 X 90 Bolt Pattern? The 4 X 90 Bolt Pattern or Pitch Circle Diameter (PCD) is made up of the stud count (4) and the bolt circle measurement (90), the notional circle determined by the center position of the studs. Measure 4 lug wheel bolt patterns from center to center distance between two studs that are across the hub from each other. This measurement is your bolt pattern diameter. Learn more about wheel dimensions. The 4 X 90 bolt pattern is common to SUZUKI vehicles. It is prudent to re-torque wheels after about 60 to 90 miles (100km to 150km) of driving. Learn more about lug nuts and torque. Key Identifying Wheel Dimensions: Wheel Bolt or Lug Pattern (or bolt circle, lug circle, lug pattern, etc.) 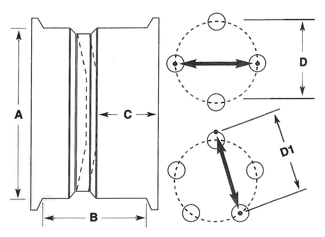 is the measured diameter of an imaginary circle formed by the centers of the wheel lugs or bolt holes. 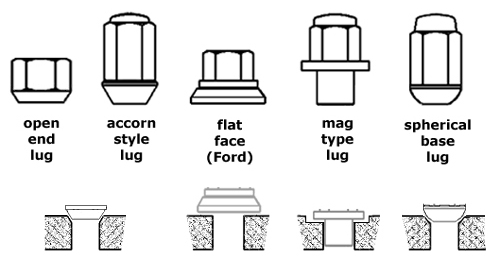 Bolt patterns can be 3, 4, 5, 6, 7, 8 or 10 lug holes. 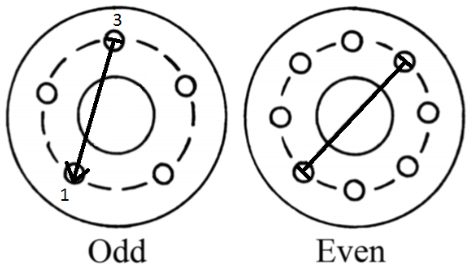 A bolt circle of 5 x 4.5 would indicate a 5 lug bolt pattern on a circle with a diameter of 4.5 inches. There are four important measurements that are used to categorize and identify a wheel for fitment purposes. Rim Diameter The actual diameter of the wheel at the point where the tire bead seats (NOT the outer lip of the rim). Rim Width Measure from the inside of the outer lip at the bead seating point to the inner lip. Back Spacing From the inside of the wheel at the point where it contacts the hub, brake drum or axle flange to the inside edge (lip) of the wheel. Bolt Pattern The measured diameter of an imaginary circle formed by the centers of the wheel lugs or bolt holes. If there is an EVEN number of lugs: Measure center-to-center on lugs directly across from each other. If there is an ODD number of lugs: Measure from the CENTER of one lug to the OUTER EDGE of the hole diagonally across from it. 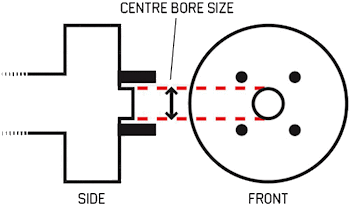 Hub Center Bore: Relates to the center hole in the wheel that centers the wheel on the hub of the car. 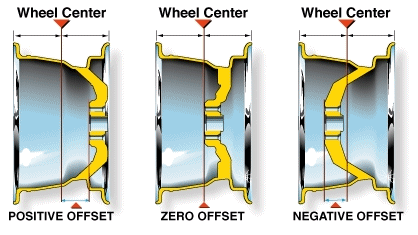 Since most wheels are mass produced, they have a large center bore to accommodate several different vehicles. If this is the case, it is recommended that you use a hub ring. Hub rings are hard plastic or metal ring that fits between the wheel and the vehicle. This centers the wheel perfectly on the hub ensuring that there is no run out when the wheel is installed on to the vehicle. Without hub rings it is possible to get vibrations even if the wheel / tire assembly is perfectly balanced. Wheel offset is the distance from the mounting surface of the wheel to the true center line of the rim. A positive offset means the mounting surface of the wheel is positioned in front of the true center line of the rim / tire assembly. This in effect brings the tire in to the fender well more. Conversely, a negative offset means the mounting surface of the wheel is behind the true center line of the rim / tire assembly. This will cause the tire to stick out away from the vehicle. This information is accurate to the best of our knowledge. No warranties or guarantees are expressed or implied as to the accuracy of the information provided on this site. Use of this site constitutes your agreement to these terms. 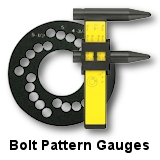 How to Measure Bolt Pattern Bolt pattern - diameter of an imaginary circle formed by the centers of the wheel lugs. 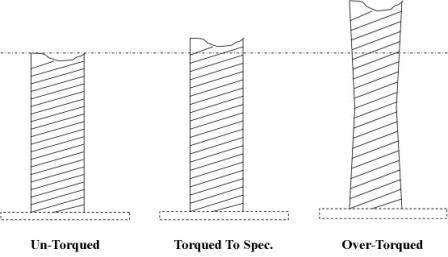 Wheel Lug Nut / Bolt Torque Sequence Correct Wheel Lug Nut / Bolt Torque Sequence - 4 lug, 5 lug, 6 lug. How to Measure Wheel Back Spacing This measurement is important to be sure you have proper wheel clearance. How To Read A Tire Sidewall Learn to understand the common markings found on tire sidewalls. Wheel, Tire and Fender Fitment Calculator Calculate Wheel Fitment, Tire Stretch and Rolling Radius. Includes Speedometer Error Calculator. Play with specs, try different settings and combinations, compare results. Tire Size Change / Speedometer Calibration Calculator This calculator is designed to give information related to tire size changes and the general impact they have on the calibration of a speedometer. It determines speedometer error and tire size information based on published and generally accepted tire dimensions as given by the standard US tire system (i.e. 205/45-ZR16). All calculations are based on the assumption of a new tire (as opposed to used) where the numbers on the tire accurately represent the dimensions.